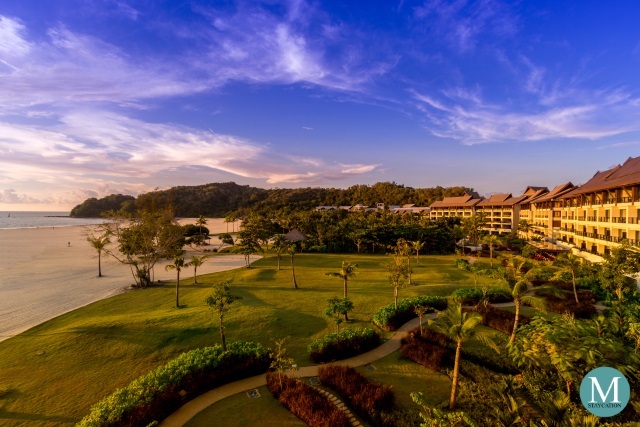 The Ocean Wing Premier Room is one of the seven room categories of Shangri-La's Rasa Ria Resort & Spa, Kota Kinabalu and is the only room category of the resort's Ocean Wing. 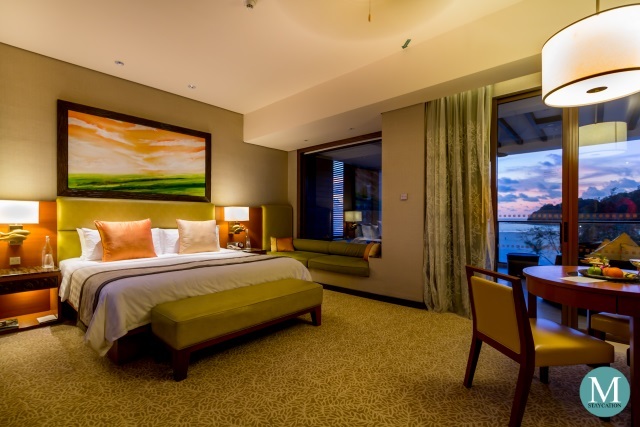 The Ocean Wing Premier Room is famous for its spacious interior and spectacular sea views from its private terrace. 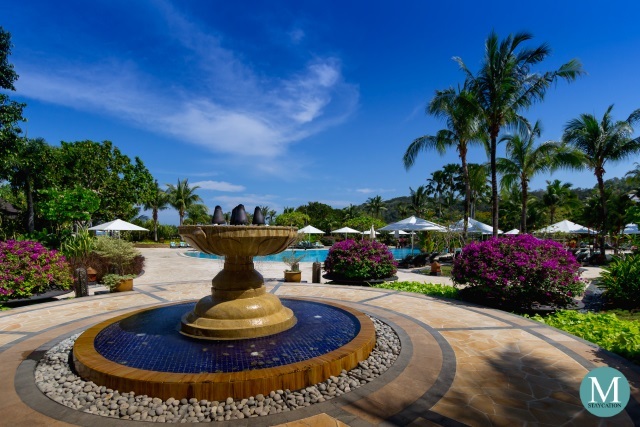 The Ocean Wing is the exclusive side of Shangri-La's Rasa Ria Resort & Spa reserved for the most discerning travelers who desire privacy and the highest standard of luxury accommodation. The Ocean Wing offers a feeling of isolation, a sense of calm and serenity. 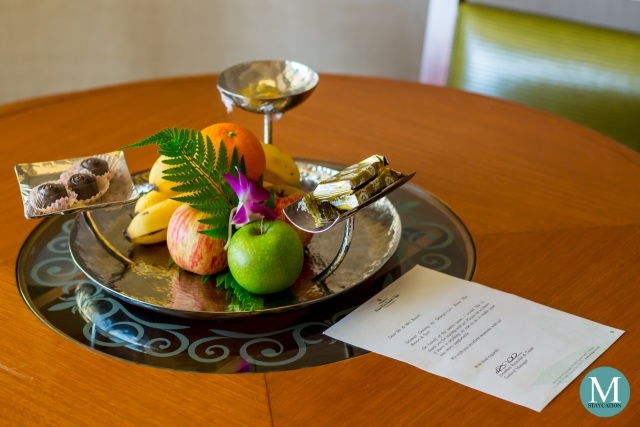 Guests also enjoy exclusive amenities and benefits, as well as personalized service during their stay. As part of my welcome amenities, I received a platter of fresh fruits as well as some chocolate pralines and macarons. I also received a bottle of red wine with a hand written note from the resort's general manager. 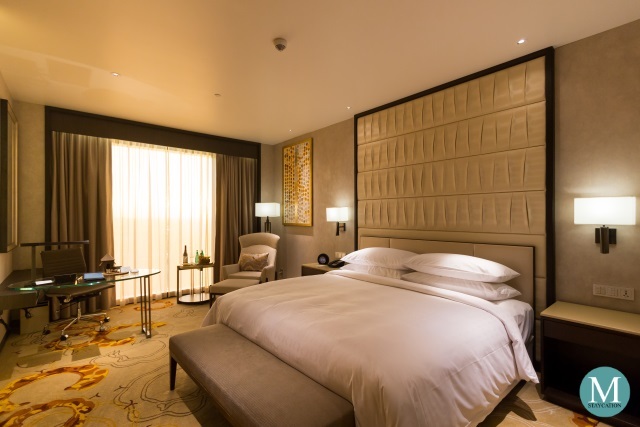 The Ocean Wing Premier Room provides 90 square meters of personal space. 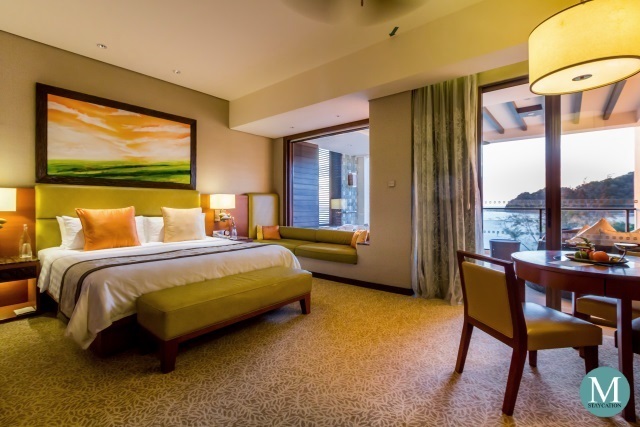 This luxuriously spacious room is furnished with a king bed, two bedside tables, and a seating area. 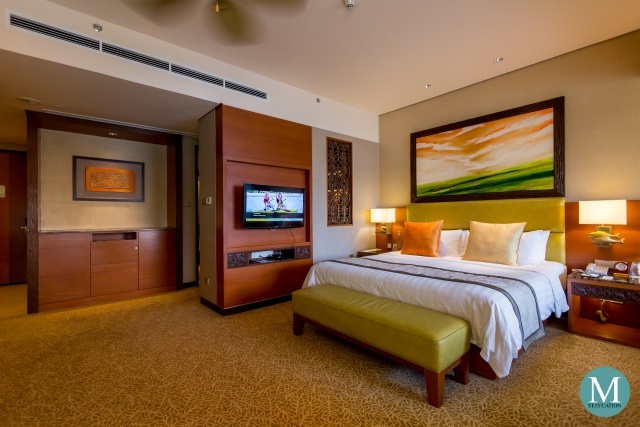 Just like my bed at Kowloon Shangri-La Hong Kong, my bed here at Shangri-La's Rasa Ria was equally comfortable. An extensive pillow menu can also be found next to the bed. Switches to the in-room lighting, controls to the blackout blinds, as well as universal power sockets were conveniently located next to the bed. Bottled drinking water and glasses are also placed on each bedside table. 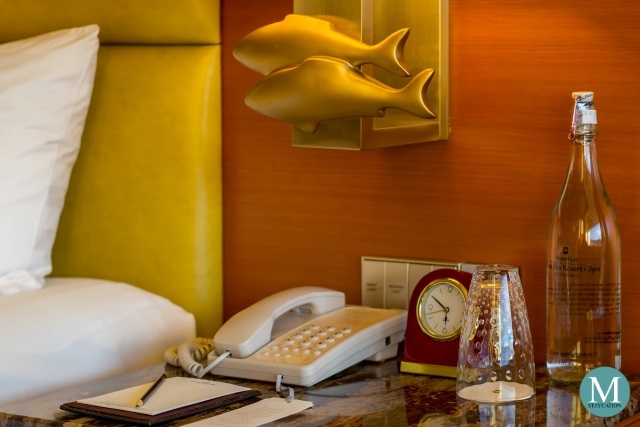 I particularly love the fish motif of the bedside lamps. The Ocean Wing Premier Room also has a dining area and a work area. The dining table can seat up to four persons and is perfect for in-room dining. While the work area is located next to the dining area, I would prefer to use the dining table when working with my laptop. 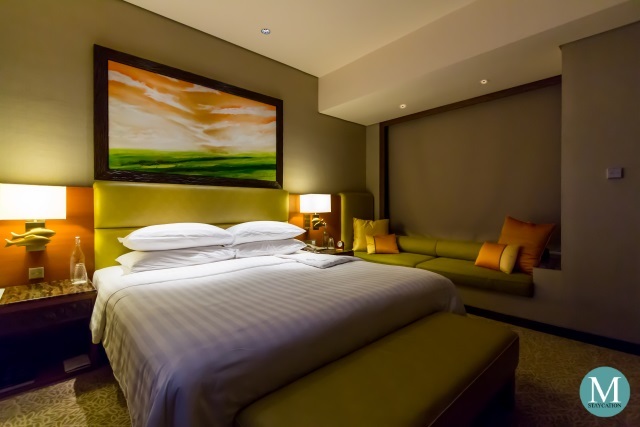 None the less, business travelers will certainly love the executive writing table which offers various options of connectivity such as the complimentary wifi internet and wired LAN ports. 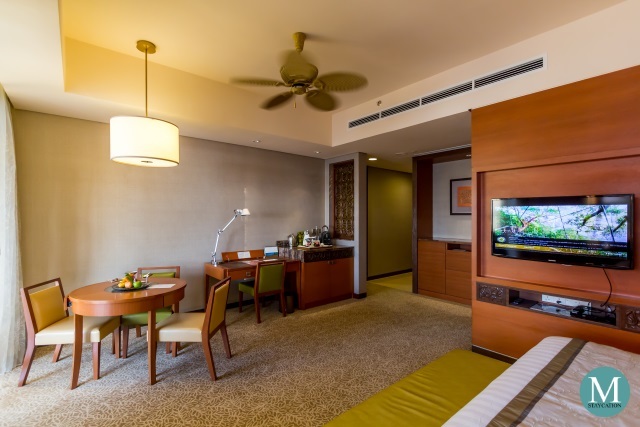 The room is also equipped with a flatscreen television with local and international cable and satellite channels. It is mounted on a wall located beside the foot of the bed. Guests can comfortably watch TV from the seating area or the dining area. 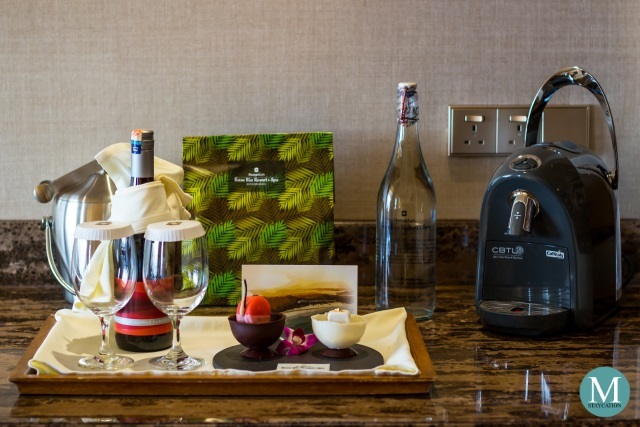 In-room amenities include a CBTL coffee machine and an electronic kettle for making tea or instant coffee. There is also a complimentary minibar which is replenished daily. 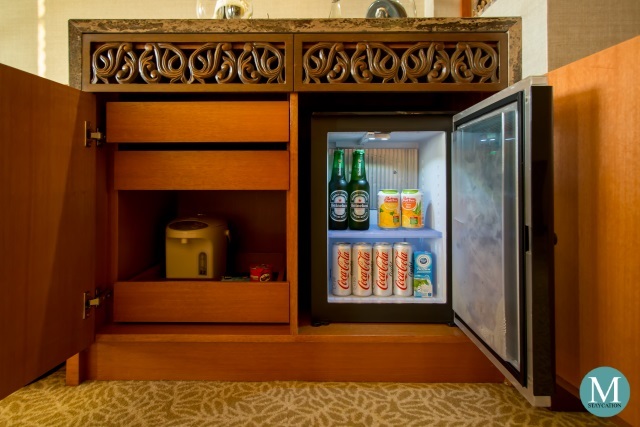 The mini refrigerator contains bottled beer, canned juices and assorted sodas. I called guest services and told them that I only want Coke Light in the minibar, and housekeeping immediate came and replaced the other sodas with Coke Light. 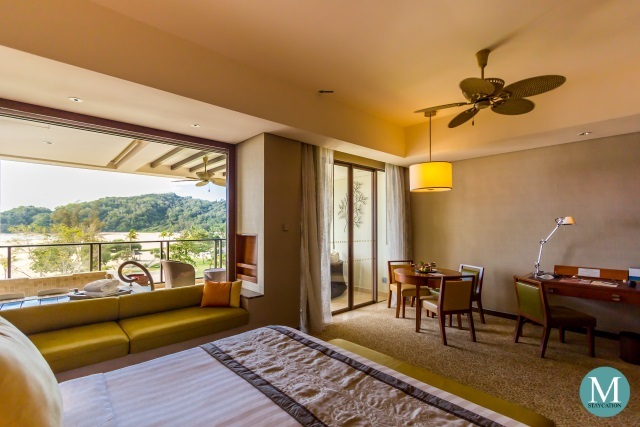 The highlight of the Ocean Wing Premier Room is the spacious private terrace where guests can enjoy an unobstructed view of the beachfront and of the vast sea. The outdoor daybed is ideal for those who wish to enjoy the cool sea breeze in the morning. 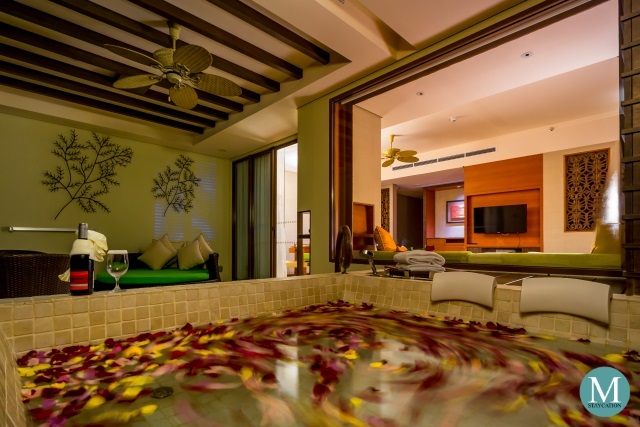 What makes the Ocean Wing Premier Room extra special is the oversized outdoor bathtub that can comfortably fit two persons, perfect for couples. With the resort facing west, the private terrace of the Ocean Wing Premier Room is also a great place to marvel at the sunset. 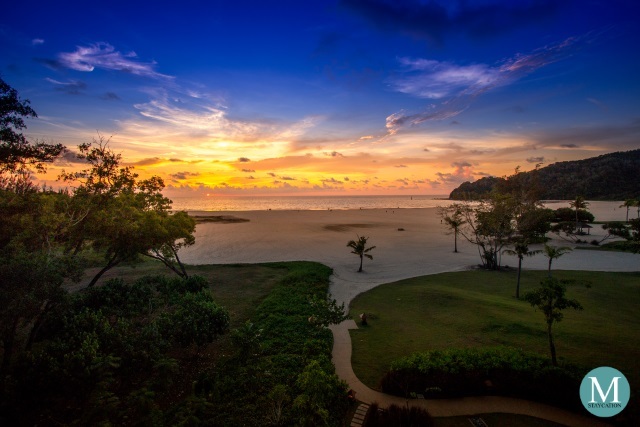 Similar to Manila, Kota Kinabalu is also famous for its stunning sunsets. I, on the other hand, preferred to escape the heat and the humidity by staying inside the well air-conditioned bedroom, prepared myself a cup of coffee and watched a movie until about dinnertime. 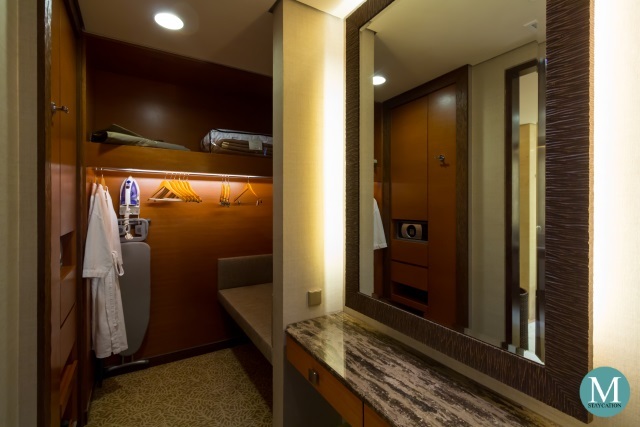 The Ocean Wing Premier Room has a walk-in closet that leads to the en-suite bathroom. There's a vanity table where you can place your personal grooming items and a back-lit vanity mirror which women will surely love. A hair blower is stored inside one of the cabinet drawers. The closet itself was very spacious. To the left are cabinet spaces where you can store your folded clothes while an open closet would be perfect for hanged dresses and pants. Ample wooden hangers are provided. Long staying guests, business travelers and MICE attendees will be pleased to have an iron and ironing board available for their use inside the room. The luggage rack can accommodate any size of luggage either underneath the rack or on it. There's also an in-room safe big enough to store a laptop. 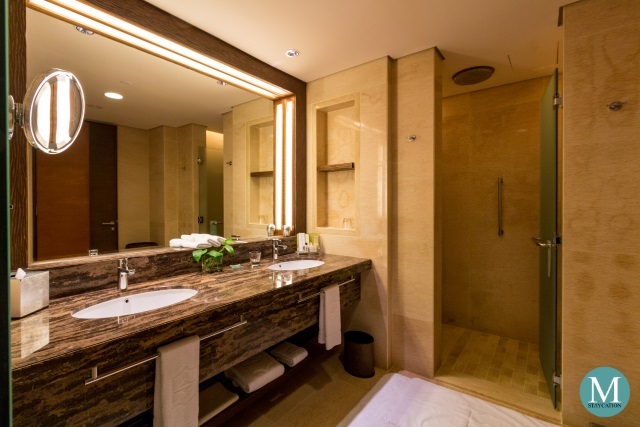 The en-suite bathroom was luxuriously spacious and elegantly designed with marbles and hard wood. 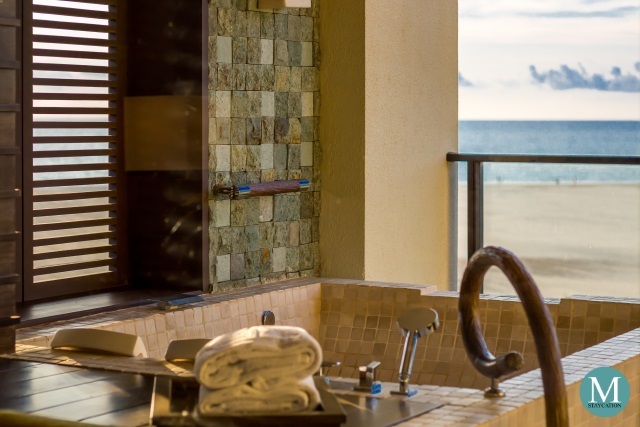 There's a his & her sink with generous countertop space where guests can place their personal toiletries. There's a separate walk-in shower and water closet. 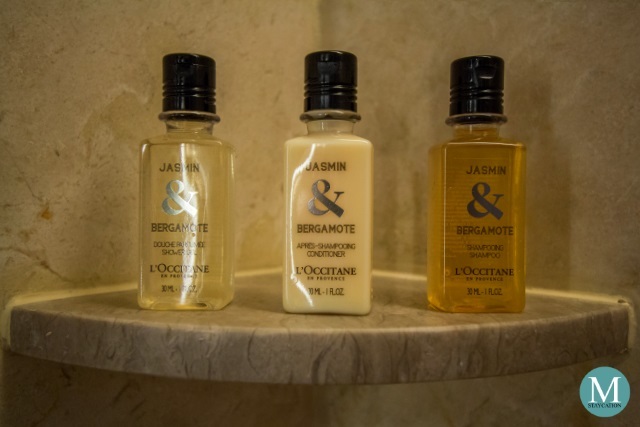 Guests staying in an Ocean Wing Premier Room are provided with Jasmine & Bergamot bath amenities from La Collection de Grasse of L'Occitane en Provence. These set of toiletries are currently my favorite and they really make me feel excited every time I stay in a Shangri-La. In-room dining is available 24 hours a day. The menu is quite extensive with choices from Western and Asian cuisines, including some local Malay dishes. 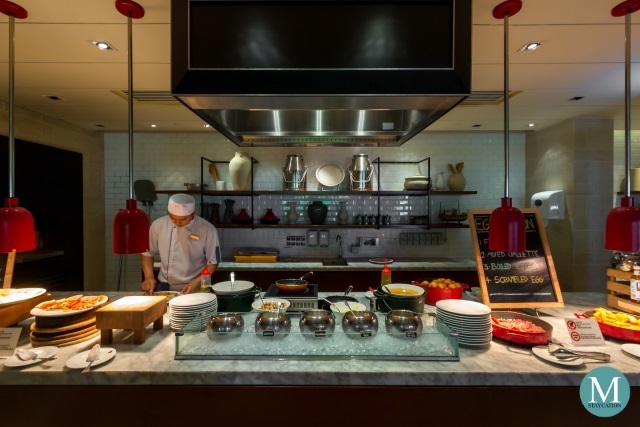 Shangri-La's Rasa Ria Resort also has eight dining outlets which guests can also try during their stay. 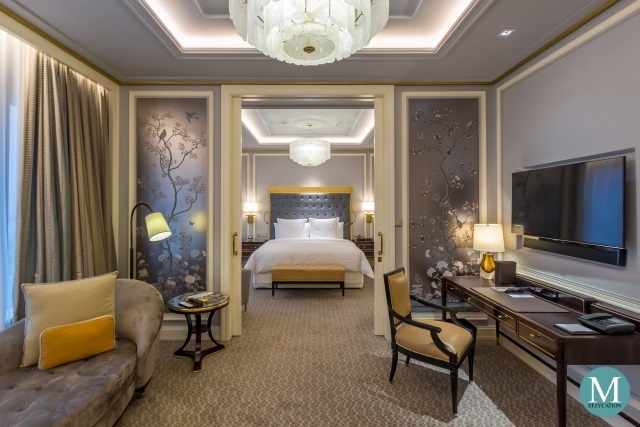 The exclusive benefits of guests staying in an Ocean Wing Premier Room include a one time complimentary bath indulgence which guests can avail during their stay. There are three choices from the bath menu: Rose Petal Bath, Bubble Bath and Mineral Soft Bath. I highly recommend the Rose Petal Bath. 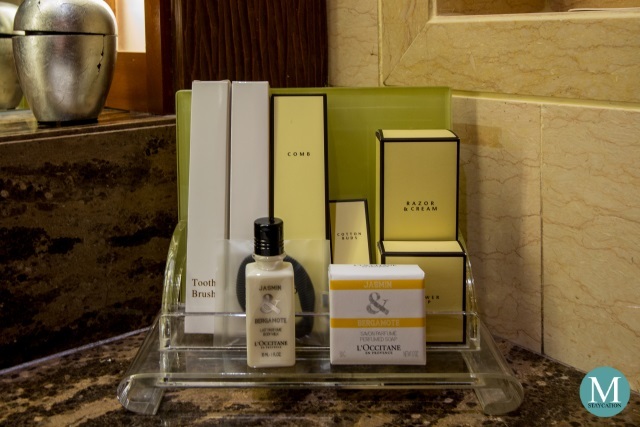 To book your bath indulgence, just call guest services at least an hour before your preferred schedule. The bath indulgence is available daily until 10:00pm. 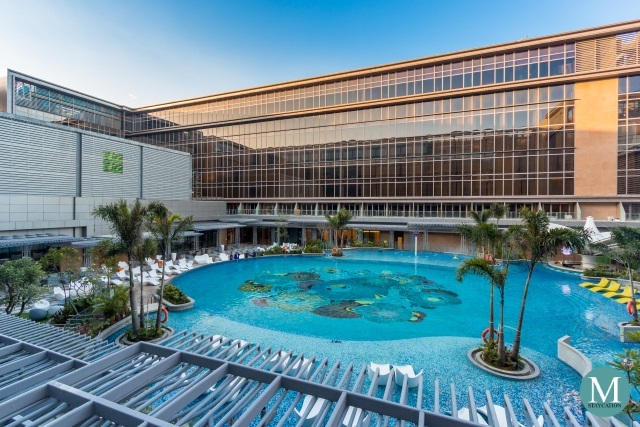 Guests who booked an overnight stay at the Ocean Wing can choose to take their buffet breakfast either at Oceano Italian Restaurant (exclusive for Ocean Wing guests) or at Coffee Terrace, the all-day dining restaurant located at the Garden Wing. 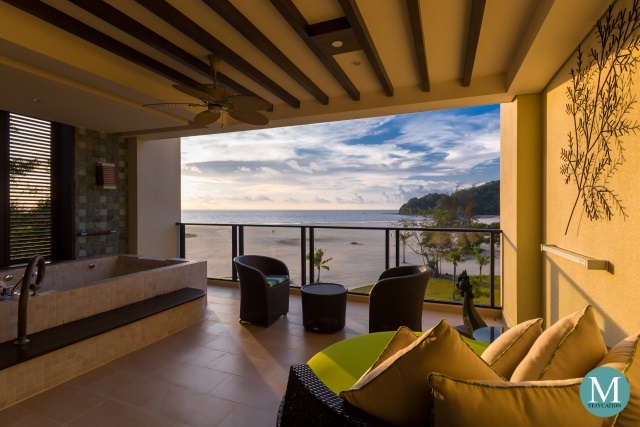 Whether your are a local seeking to escape the busy city life in Kota Kinabalu or a leisure traveler in search of a memorable holiday in Sabah, Malaysia, you will surely love the privacy and the luxuriousness of the Ocean Wing Premier Room. Earn 1 GC Award Point for each USD 1 qualifying spend when dining at over 500 participating restaurants & bars worldwide. GC Award Points will be credited to a your account two weeks after the date of transaction. Redeem your points instantly at any Shangri-La restaurants & bars with 10 GC Award Points covering every USD 1 of your dining bill. You may also choose to redeem your points for dining vouchers online. 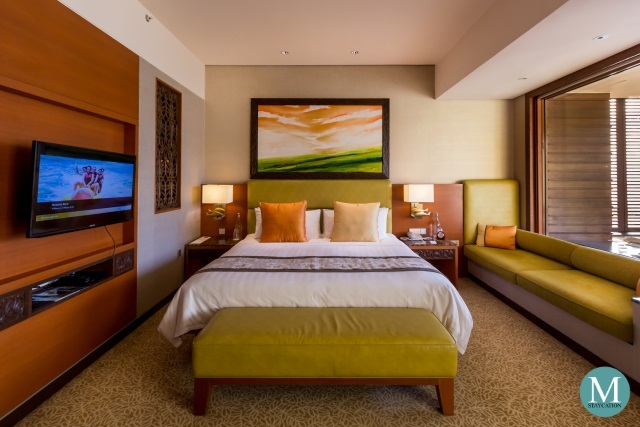 Redeem your points for free room night stays at any Shangri-La, Kerry Hotel, Traders Hotel or Hotel Jen worldwide.